Summary: iFonz 2 is a new Windows Mobile interface, with a lots of customization and a fully graphical design and animations for Windows Mobile 5/6 completely writed in .NET. The program use Calibri.ttf and install it automatically at start, but if it can't find WindowsFonts it start with Arial font. For Install Calibri font go to Utils folder in iFonz directory and copy Calibry.dat in WindowsFonts folder and rename it in Calibri.ttf. 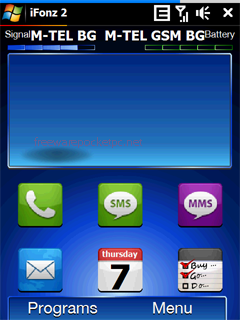 Download iFonz 2 Themes here (850 KB) or its mirror here. - Converted Settings.dat file in a normal txt file and dismissed XML (Old settings will be converted first time you start new version). - Resolved problem with special character in filenames and error in load settings. - Now when battery charge you see how much is charged the battery in home page. - Now you can create Battery.png and Signal.png in vertical to create a good animations (See AndroidVGA theme). - Now if you set 0 to Seconds line you dont see it in Analog Clock. - Now when press Enter key you can switch first and last page of icons, if you have only 1 page go to home page, and in home page go to programs page. - Added Background to programs page, if you set a wide background it do the panoramic during the slide (use more memory and it's slowly). - Rewrite the graphic engine for programs page. - Added option to set and color shadow text of icons in Programs page. - Added option to set and color rounded back rectancle to text of cons in Programs page. - Added option to show Fps in program. - Added gesture from up (top) to down to minimize iFonz. - Added animations on starting applications, now you can set in Configurator the colors of Open rectangle animation. - Added type icons in Program page with notifications ballon. - Added small and big notifications bitmap. - Now if you slide pages you can go from page 1 or last page to homepage and viceversa. - Now you can edit single icon directly in the programs page to modify all information about it. - Integrated Configurator in iFonz for more speed settings open and use. - Added and rewrited the move action with animations. - Added for search files the "Windows Programs ->" item to go directly in the folder "WindowsStart Menu". - Added option to show/hide Windows Task bar. - Added iFonz2Configurator.exe in the folder to set all options of the program. - General speed improvements. - Fixed error with big text day on Calendar top, use only integer value in settings.dat for "TextSizeCalTop" option. - Added a lots of options for customize iFonz 2. - Optimized the reload of programs when Rename, Move and Delete. - Fix an error with battery signal when is critical. - Removed Favorites in scrolling list of files for now. - Now Settings.dat is created/completed with missed default values. 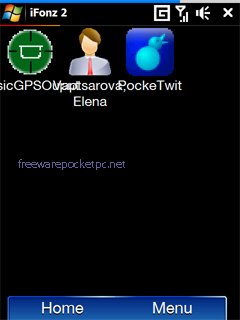 - The loading of iFonz is a little more slow of old version because now load settings and icons at start. - Modify the maximum number of button in Home Page to 12. - Now click icons is more simple and the sensibility is correct. - Added Enter key to return to page 1 in Programs. - Added function to return automatically in iFonz when close it or a program. - All code are rewitten. - Added Clock (Analog & Digital) on Home Page. - Added Sroll list explorer files and contacts. - The program work on all devices resolutions only in Portrait, change DirGfx in Setting.dat for Resolution (gfxQVGA or gfxVGA). - Added Settings.dat to customize a lot of graphics (XML style). Cool little app but could not get rid of the annoying banner notifying me that this version is obsolete. if u want a customizable shell get spb, also about this app : i think it says enough, and i quote "and is completly writed in .net." lol!